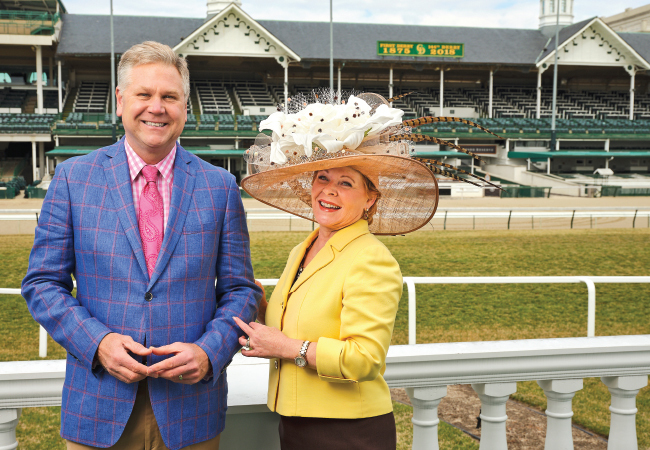 For nearly 30 years Doug Proffitt and Melissa Swan of WHAS 11 were the team that brought the Derby into the homes of many Louisvillians. Our own Rocko Jerome took them back to Churchill Downs, where their memory lane happens to be home to the most exciting two minutes in sports. If you didn't already know, strolling into Churchill Downs with WHAS stalwarts Doug Proffitt and Melissa Swan in the middle of an early Spring weekday will show you just what these two have meant to the Derby over the years. It's waves, warm smiles, and even a few double takes from Churchill Downs employees and patrons alike. Doug and Melissa are warm and congenial in return, carrying themselves with equal parts comfortable poise and easy affability, just the qualities that we all like to find in those that we trust to broadcast the news. Together, they brought the singular event that is the Derby into our homes each year for nearly 3 decades, allowing a glimpse at the majesty of Churchill on its most glorious annual day for all to see. "The goal in presenting the Derby is always to make viewers see the scope of Churchill," Melissa says. "Most people can't be here. The idea is to bring them here via what we convey." It's a place that brings back a flood of memories. The first thing that catches Doug's attention are the original spires and a comparatively small set of stands, dwarfed by the sprawling complex all around the hallowed horse track. "That's it," he observes. "Originally, that was all there was." He's seen an immense amount of change since his first Derby. That was in 1979 when Doug, a lifelong Louisville native, was an intern for WHAS. "They had me assigned to driving the production van. The key thing on Derby Day back then was that the reporters, Jim Mitchell and Kirstie Wilde, needed to get out of Churchill Downs and over to the studio pretty much as soon as the race ended. I knew if I didn't execute that properly, my aspirations of working in news would likely come to a screeching halt." Doug's career in news took him around the country to a few different stations, then finally back to Louisville and WHAS in 1987. He's remained there ever since. Melissa had already been reporting there for a few years. They became fast friends, but little did they know that they would be colleagues for so long, or that they would become like family. "You're just together so much and having these remarkable experiences," says Melissa. "We formed a strong bond." The years rolled along, with that annual first Saturday in May a constant marker for the progress of their lives. In conversation about the Derby, most of them blur together. The years that it rained and rained. That year that it snowed. The time that it was so hot that Melissa took her shoes off and then found that her feet had swollen and she couldn't get them back on, then had to spend the rest of the day at the track barefoot, something that they still laugh about. There are also some dates that they never forget the exact circumstances of, like 1989. That year there was sleet, and Melissa was pregnant with her daughter, Mary Hannah. In 1997 it was rainy and muddy, then Doug's son Seth was born just 10 days later. "Silver Charm won that one," Doug says, a gleam in his eye. Doug continues at WHAS, a reliable and trusted face in local news. He's fostering young anchors like Lisa Hutson along the way. However, Melissa made the hard decision to retire in 2016 and is now preparing to launch a new podcast, to be entitled "Swan Dive." She's excited about the future, but the bonds to her WHAS cohorts cling tightly. "We're all going on a big group vacation together with all of our families soon," says fellow colleague and close friend, Rachel Platt. "If that's not a testament to strong love, I don't know what is." When asked to sum up that experience in broadcasting the Derby, Melissa says it clearly. "It was always a great deal of hard work, turning around from the 11 PM broadcast the night before and coming to the track early in the morning, and watching as it went from a day of coverage to basically a full week, but it was absolutely a tremendous privilege, and I feel so lucky to have been a part for so long. A more beautiful experience, I could not ask for." Lisa Hutson is the newest anchor at WHAS 11 and for her, joining the team been an experience of tremendous magnitude. "Even growing up as far from Louisville as western Kentucky, everyone knew Action 11 news. It was always a true benchmark. Being part of that now and following this tradition, it's an incredible honor." Before WHAS, Lisa found herself reporting for stations in Little Rock, Cincinnati, and Waco before returning to the Bluegrass State in January of last year. "After I lost my mom, it felt very important to come back and be closer to my family." She's found herself tighter now with her literal family and has also been treated as such by the crew at WHAS. "I was born in 1987, and that was the same year that Doug Proffitt began reporting for WHAS. His wisdom and his acumen are just beyond compare, and he's been so gracious to share his knowledge with me." She holds Melissa Swan in equally high esteem, as well as the recently retired Rachel Platt. "Rachel really taught me some amazing things about the balance of career and the rest of your life, as well as the importance of being yourself," Lisa says. "I came in just after Melissa retired, but her example is tremendous. She has such incredible poise. I'm so in awe of these women. They're true trailblazers." Lisa is looking forward to covering -and attending- her second Derby this year. "I know it's a shame, but I had never been before covering it last year," she admits. "Everyone at WHAS was so kind to me. Doug showed me how to properly place a bet and Rachel brought in hats and dresses and things for me to borrow." When reached for comment about that, Rachel recalls; "I was just continuing a tradition! 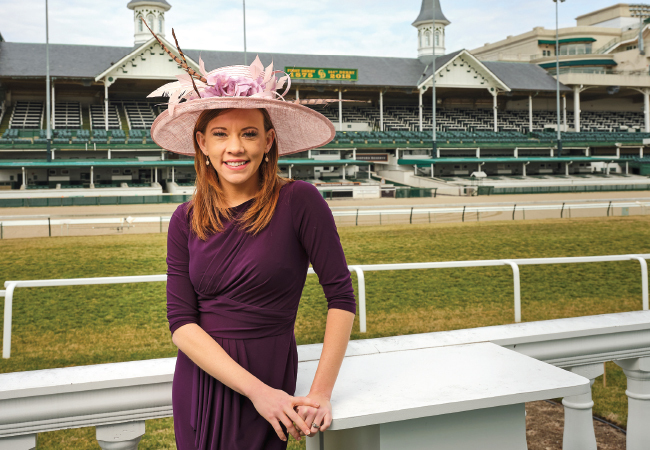 It was Melissa who loaned me my first Derby hat, as well." "Nothing could prepare me for really being there," Lisa says. "Just really visceral things like the array of gorgeous colors and the thunderous sound of the horses made such an impression. I literally got chills when they played My Old Kentucky Home." The sun shines bright on Lisa's future, as she looks forward to many more Derbies to come.